I really enjoy well made dal. With hot or warm rotis or plain or cumin spiked rice, dal is always comfort food for me. 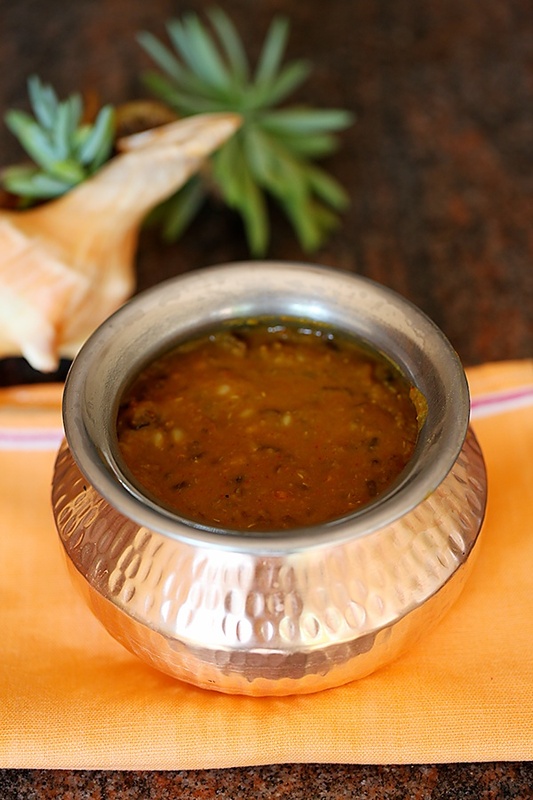 Langarwali dal is a dish that my family relishes as well. “Langar” is the free meal service provided in Sikh Gurudwaras to all visitors. The philosophy behind “langar” is that everyone without any distinction of cast, creed religion will be able to partake this food and that is the reason the food served here is usually vegetarian and without onion and garlic. And anyone who has eaten food in a “langar” will vouch for the taste factor. The dal I’m featuring today is transformed into something delicious, elegant and fragrant with the use of simple ingredients. In the Bollywood Cookbook the “langarwali dal” is listed as one of actor Shahrukh Khan’s favourite dishes. The restaurant manager at the Masala Bay restaurant in Taj Land’s end which is on the same lane as the superstar’s house had once told me that their “langarwali dal” is what he orders often when he dines with them. I usually opt for the ‘langarwali dal” because of the absence of onions and garlic but was pleased to note that several people without any dietary restrictions have marked this as their favourite as well. Let me reiterate the fact that this dal has no fancy ingredients, no copious amounts of butter or cream. And perhaps that is the reason one is able to actually taste and relish the dals with just a few spices and herbs playing the supporting cast to bring out the magnificent qualities and taste of the hero of this dish, the black gram dal. I always like to soak my grains and pulses before cooking with them. Years ago I came across this philosophy of being kind to your grains and in return they will be kind to you. And what this means is that digestion and assimilation of the nutrients becomes easier when you soak your grains. Soaking grains and pulses has actually been practiced by our ancestors and is a century old practice. It is known to breakdown antinutrients and hard to digest elements like phytic acid, an antinutrient found in grains and legumes. Some grains and legumes require soaking overnight and some will do with just 15 to 20 minutes of soaking time. It is such an easy process that requires a little amount of planning that will in return do a world of good. 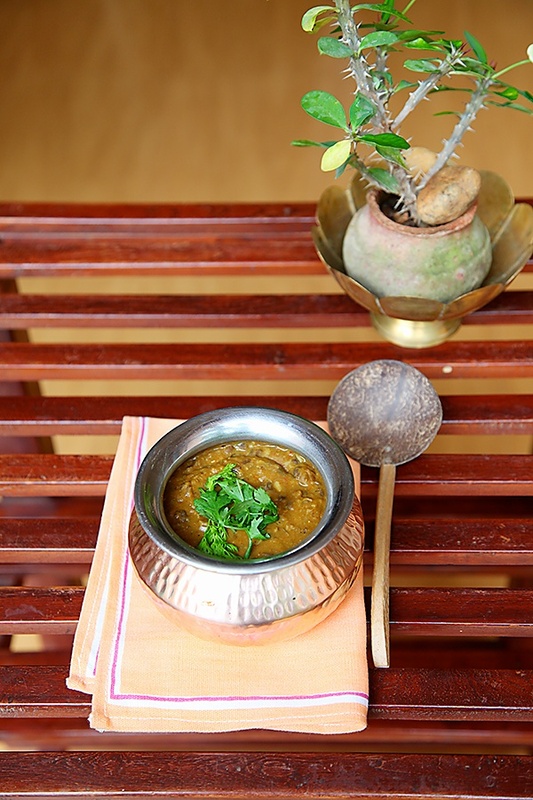 The “Langarwali Dal” is simplicity, comfort, taste and nutrition in a pot. And tell me..how many dishes can stake a claim to so many important factors that make a nice and healthy meal? So, reserve some space for this bowl of goodness in your lunch or dinner menu be it for a party or for an everyday meal. It is sure to make some space in your heart as well! Wash the dal well and soak the dals in water for about 15 minutes. Drain the dal and put in about 3 1/4 cups (800 ml) water. Stir in the turmeric and cook covered for about 1 hour, adjusting the quantity of water if required. Alternatively cook the dals in a pressure cooker for about 15 to 20 minutes on the lowest heat after the first whistle. 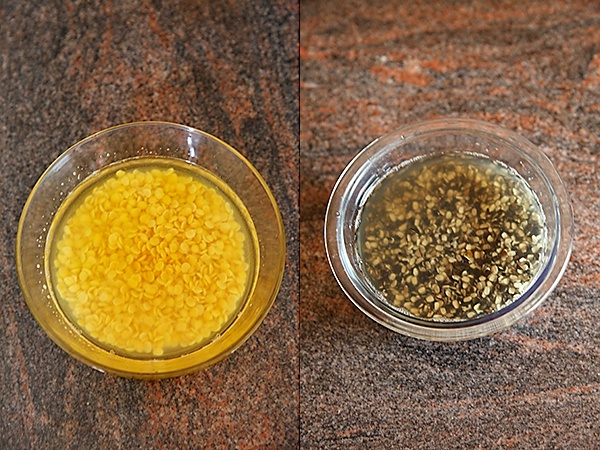 In a wok or kadhai, heat the ghee or vegetable oil on medium heat. Stir in the cumin seeds and when they change colour and plump up a little, lower the heat and put in the ginger, green chilies and tomatoes. Cook until the tomatoes turn soft and pulpy. After the tomatoes turn soft, stir in the spices, the coriander powder and red chili powder. 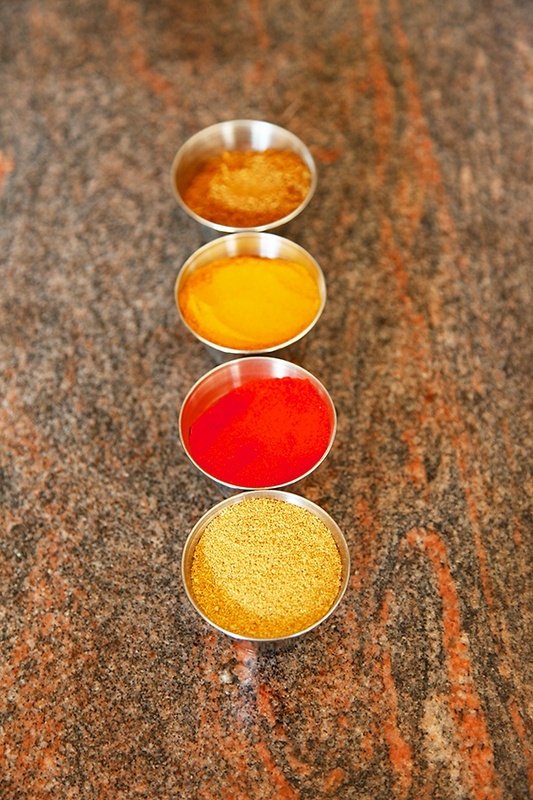 Stir this mixture into the cooked dal. If your wok is big enough, you could also put in the dals into the wok. Put in the salt. Mix well. Adjust the consistency with hot water if required. Put in the fresh coriander leaves and serve hot with warm breads, rotis, chapatis or rice. There is a Punjabi restaurant at Mysore called 'Jwala'. We often visit there for Punjabi food, and everytinme I order any of the dal item over there. Now I have got this recepie from you and will definitely try this. Dal with rice is comfort food for me too. 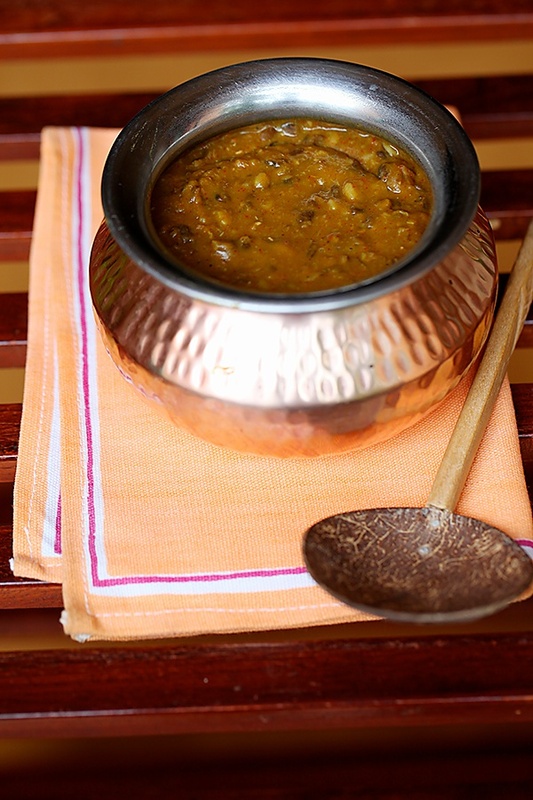 And this dal makes my mouth water! I am a long time (but silent;-)) follower of your blog and your recipes turn out perfect every time! Saying that,what surprises me here is the exclusion of asafoetida in this recipe!! Am I missing out something?? A few questions. Do we have to drain the water in which the dal is soaked and add fresh water again while cooking or can we use the soaked water itself? Does the soaked water still have the phytic acid? Could you pls share from where you get your organic veggies/organic dals/organic atta in Mumbai. can't seem to find them here in Kandivali? Beautiful clicks again. Vibrant and colourful pics. 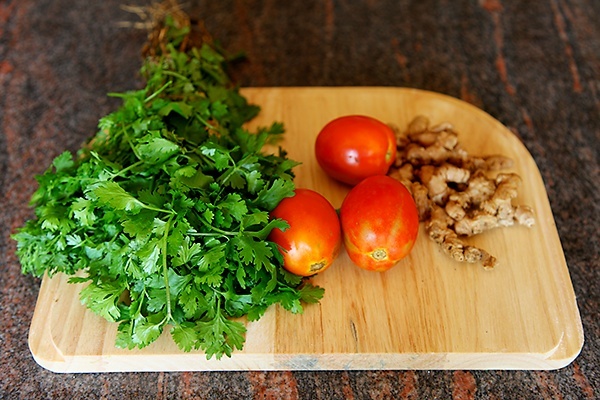 The red tomatoes next to the green cilantro and ginger look so beautiful and fresh. Keep posting and amazing us !! Shirley: Yes..I drain the water off the dal and use fresh water to cook. Organic veggies are still hard to come by and you won't find all but greencart.in has natural farming fruits and veggies. I buy the bulk of my groceries from navdanya (google for their store in Andheri and ask for home delivery) and some from 24 letter mantra. The dal looks absolutely delicious. We love all kinds of dals and this will be a welcome addition in my repertoire. Hope to try it soon. Anuradha: That is such a wonderful thought! I hope your desire is fulfilled. Preeti: Everything can be easily made without onion and garlic and can be made to taste amazing as well! Onions and garlic tend to overpower the taste of the vegetables and in their absence one can actually taste the vegetables. I have been able to stick to my dietary regulations in India as well as abroad. If you ask nicely, people usually tend to reciprocate. And when they don't, there are always options. Food is very important to me and I have been fortunate to eat a variety of food, sticking to my regulations. Onions and garlic actually became prominent and adopted into mainstream cooking during the Mughal rule. Hope this answers your question. Thanks for the info. I am already a regular with greencart.in. Didn't know about navdanya till date. I will follow up with them. 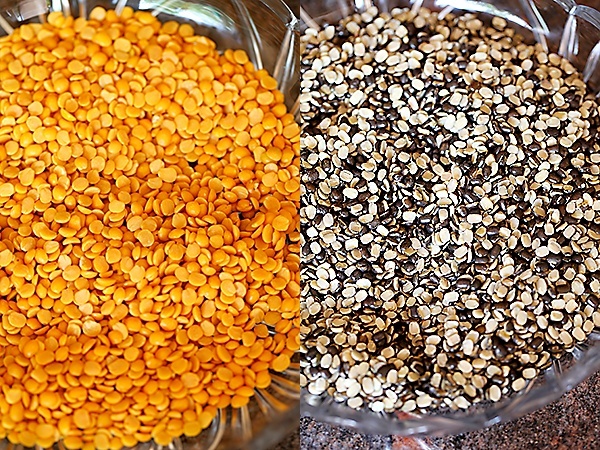 Super simple, delicious, nutritious dal. How does it get better than this? I usually like this with a cup a brown rice and roasted papad. Thank you for this recipe. We are a family of dal lovers, especially with our rotis (dinner). I bookmarked it to try sometime this week. Lovely photography Anu. The picture is so very tempting. will definitely try and update you. Shwetta: Yes this tastes great with brown and white rice. Siri: Thankyou Siri..hope you love this dal too! hi, just a doubt. your clicks show toor dal not chana dal. but ur recipe states channa dhal.. which one to use? 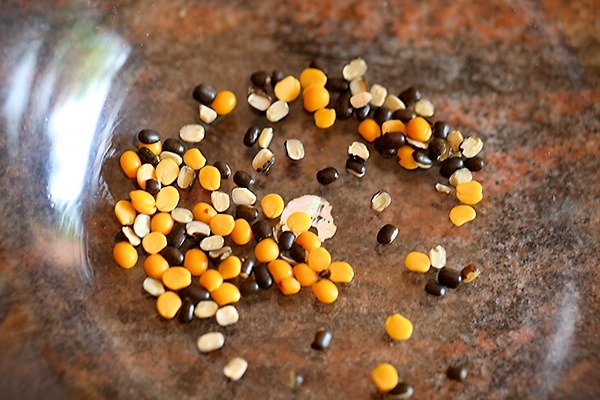 What a wonderful hassle free recipe…love your blog Anushruti.This one's next on my recipe list…wanted to know whether I can use whole black urad dal (with skin)for making Langarwali Dal.Thank you for your posts and keep them coming!! Beautiful pictures and a delicious looking dal. Will try this week. Also, must compliment you on your choice of serving dishes. Absolutely adore them. Thanks once again for the inspiring tips. Rachana: Yes you can, but the cooking time doubles. Absolutely agree with your thoughts on how some dishes are overpowered with cream and butter! I am also a lover of dal. 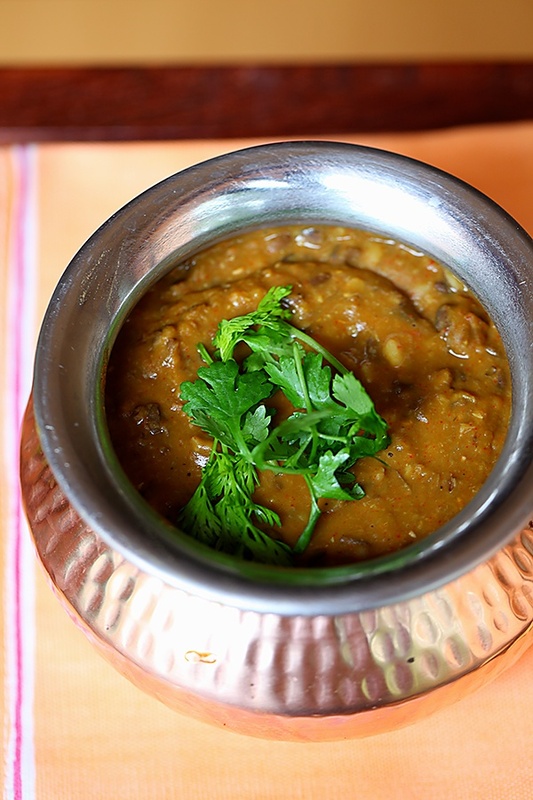 Dal contains all the proteins that human beings need and is an innocent substitute for meat-sourced proteins. Your presentation is very attractive. Will surely give this elegant dish a try. Jayashree: Well said! Hope you will love this dal. This recipe was perfect – Thank you! Priya- Glad to hear that! I tried this daal, and true to your word, it's simple but really brings out the flavour of the daals rather than overpowering them. Thanks ! Shipra: So happy to hear this! I'm glad you could experience the simplicity of this dish. Thank you for this simple yet delicious recipe. I made it for my friends, they loved it so much. The aroma was wonderful and the flavours were delicate. I love your blog! Mayur- Thanks for all the feedback. 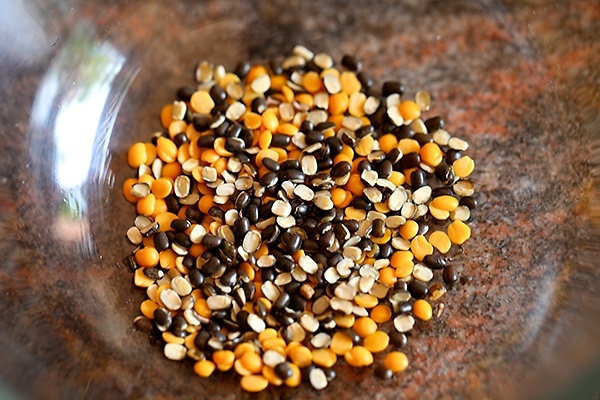 Dilekha- Black urad dal is nothing but the white dal with it's skin.